I have several scrap quilts that I have been working on using the scraps left over from Tessellated Leaves. The scrap quilt flimsy that I blogged about last Friday is finished, and I am excited to share my first finished quilt of 2015 today! The quilt finished at 34-inches wide by 49-inches long after its first wash, making it a decent sized baby or crib quilt. I can imagine lots of colorful Legos poured out on top of it as well! I backed and bound the quilt with left over backing from Tessellated Leaves as well, making it a truly scrappy finish! The backing and binding fabric is a brown fabric with tree ring print design. 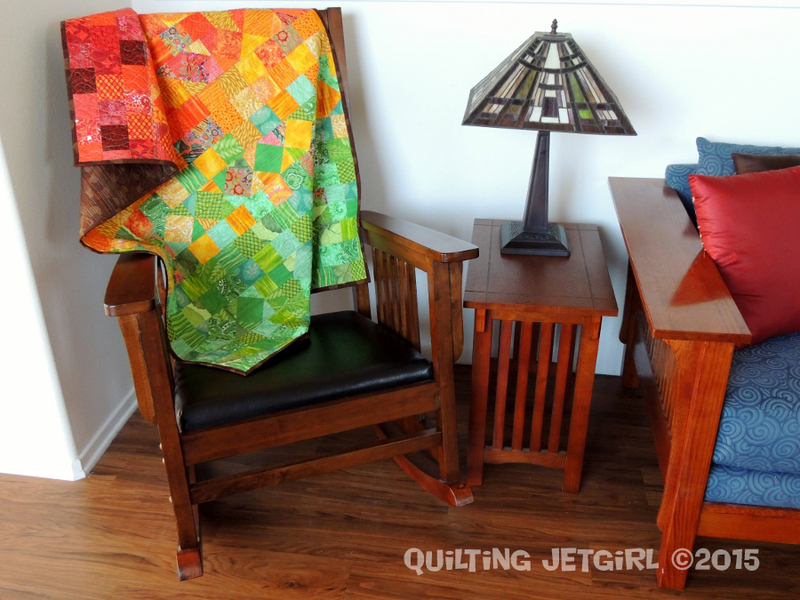 I think the brown really helps ground and frame the bold and brightly colored quilt nicely. This is the fourth quilt I have quilted on my (new to me) longarm machine. I used a Aurifil 50wt 4650 variegated thread for the quilting on both the top and in the bobbin. The colors in the thread match all the colors in the top of the quilt and it blends in so well, and I think the color pop against the brown backing fabric is so fun. I quilted very dense horizontal matchstick quilting over the diamonds in the quilt top, and I alternated between vertical overlapping, wavy lines to a meandering swirling loop. All told, it took 8 hours to make this quilt, and I had a lot of fun using up scraps. I have one more groovy scrap quilt project remaining using these fabrics, and then I will have truly used up the fabrics. Linking up to TGIFF, hosted this week by Quilt Matters, What I Did This Week at Sew Stitching Cute, and Oh Scrap! (buttons on the right hand side). It looks great, it’s always amazing how much quilting and binding really transforms a top into something extra special. And 8 hours sounds incredible, even for a fairly small quilt, I need some of your super speedy rocket fuel! Congratulations on a fabulous finish, Yvonne! What a wonderful start to the new year! Love the quilting. Can’t wait to see your Groovy scrap quilt finish coming up soon! Congratulations on your first finish of the year. The colours are gorgeous! Thank you so much! It was a quick and fun way to start the new year. That was 8 hours very well spent – love the colour especially the warm red/orange farbrics! Those fabrics all work together so well. Great job. Nice finish! I love how you use fabrics I’m unfamiliar with. It’s so refreshing seeing these new-to-me prints arranged in such interesting ways. I love the fabric layout and color gradation on this one! Looks like you have been having fun with your new machine. Congrats on the fabulous scrappy finish. 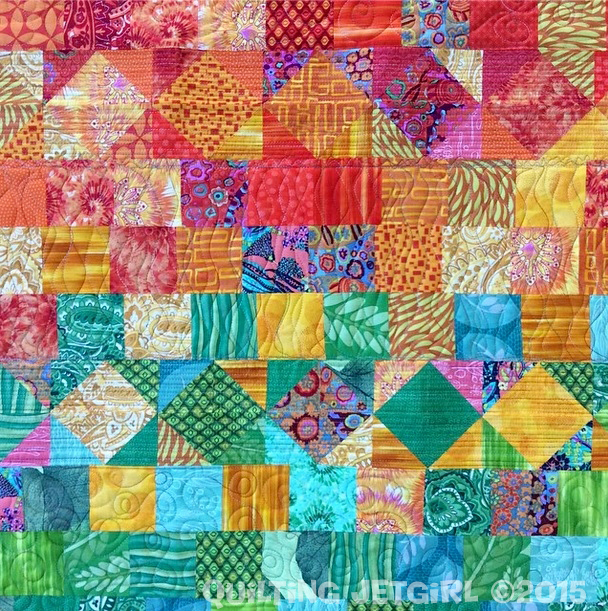 Lovely and joyful scrap quilt! Yvonne, you’re my first supporter and for THAT… I have something to send to you! Thank you so much! Also… loving your quilting on this. In such that short time since you have gotten your (new to you) machine, you’ve come so far already! Your work continues to amaze and inspire me! Wow! 8 hours?! That’s like a quilt record! I know there are those jelly roll races.. but really. That’s awesome! And it’s gorgeous! Good on you trying to use up all the scraps! You have got great value out of those scraps Yvonne, another lovely quilt. Ooh, I love those bright colours and the colours flow. Beautiful! Great way to use up scraps too. Thanks for linking up to TGIFF! I love most things scrappy! I really like how the rows of squares do not always match up, giving the quilt more movement. Nice touch! It is beautiful!!! Looking good! I never get tired of these colors. Well done! What a great way to start the year! It’s gorgeous! This quilt looks great! Fun colors and wonderful quilting. Thanks for linking up with Oh Scrap! It’s beautiful! I love how the quilting shows up on the back, and that you played around with different quilting designs. Are you enjoying the longarm? I think I love this one for the same reason I love tessellated leaves – the gorgeous colours you chose.